Sponsored by NAMI for National Mental Illness Awareness Month, this is a great chance to see this Oscar-nominated film! Sandra (Cotillard) has just been released from the hospital to find that she no longer has a job. According to management, the only way Sandra can hope to regain her position at the factory is to convince her co-workers to sacrifice their much-needed yearly bonuses. Now, over the course of one weekend, Sandra must confront each co-worker individually in order to win a majority of their votes before time runs out. 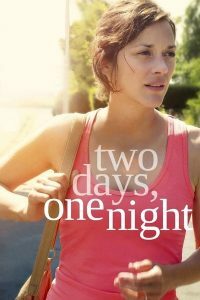 With TWO DAYS, ONE NIGHT, the Dardennes have turned a relevant social inquiry into a powerful statement on community solidarity, once again delivering a film that is simple on the surface but alive with both compassion and wisdom.